I was in the Kitchener-Waterloo area in mid October to see my son Nick graduate from the University of Waterloo. It's hard to believe he's old enough to graduate from university... sheesh. Anyway, there were trains. Here they are. As I was driving west on highway 401 on October 19th, I spotted a pair of CN locomotives doing some industrial switching. 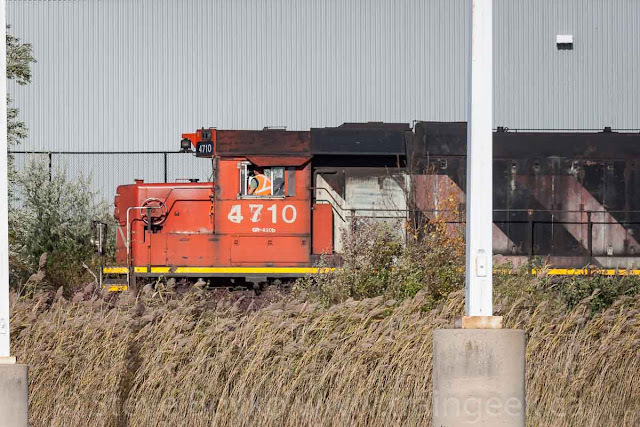 I exited quickly and found CN 4710 and CN 4136..
CN 4710 in the Guelph area? Note the numbers under the cab... CN 4710 was originally built as CN 5510 and the two "5" digits are showing through. 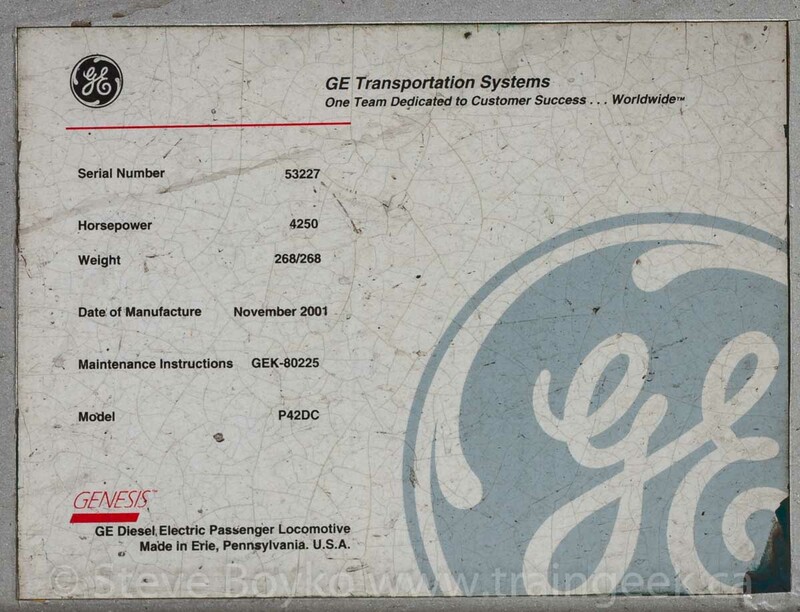 It's a GP38-2. 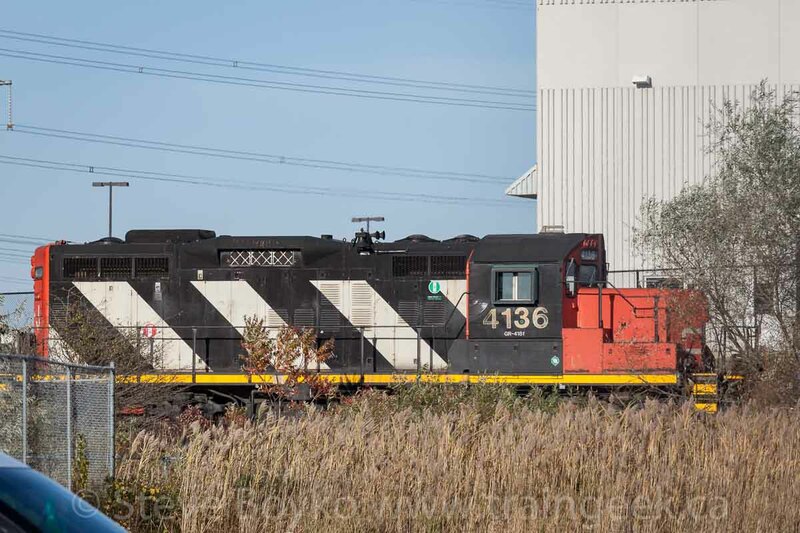 The second unit was GP9RM CN 4136 in sergeant stripes as well. Both of those locomotives were "new" to me. 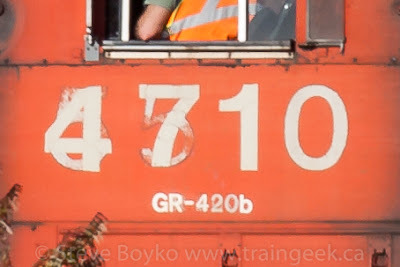 I've seen a lot of CN Geeps but not many in the 47xx or 41xx series. I checked into my hotel, and decided to take a stroll... a fairly long walk, actually. 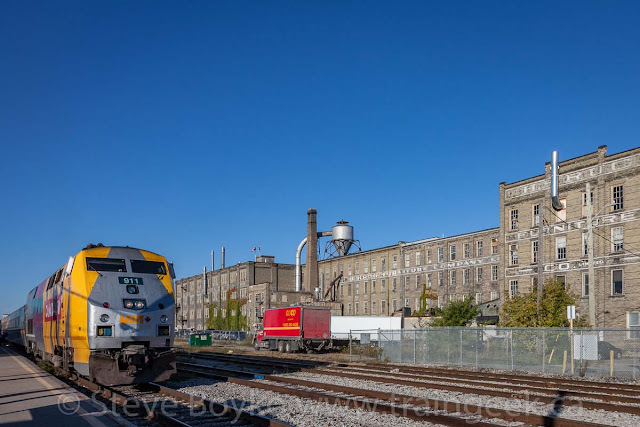 I was staying at the Comfort Inn on Weber Street North in Waterloo, and the train station in Kitchener was a good 3 kilometre walk down Weber Street. Google Maps says it takes 38 minutes to walk that but it clearly hasn't seen how fast I walk. 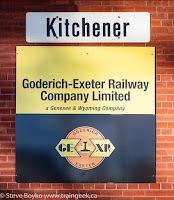 As I approached the train station, I saw there were two Goderich and Exeter locomotives parked there. LLPX 2236 and QGRY 2008 were on one of the two back tracks (See lead photo). 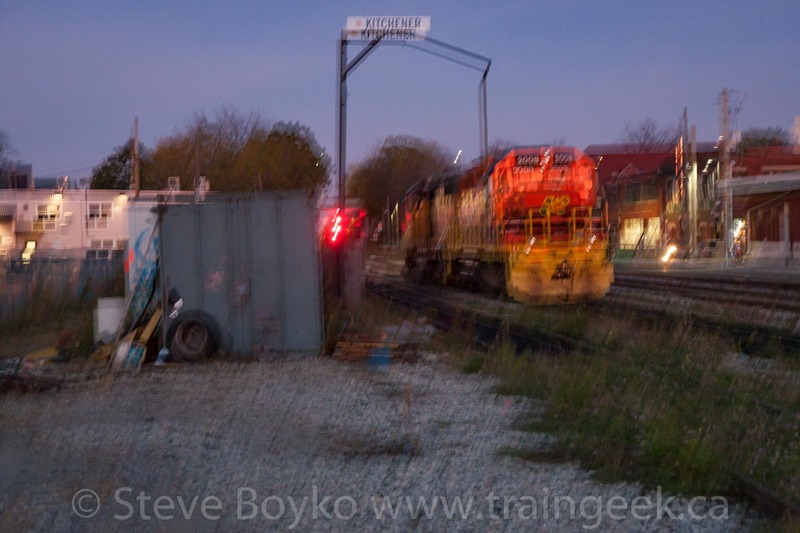 There is a fence on that side of the tracks so I was shooting over the fence, hand-held at some pretty low shutter speeds. The joy of digital is that I could take a lot of photos and toss the ones that were blurry. The above was shot at 0.3 second, f/5.6 and ISO 100. The first one is a good example of the many photos I deleted. I took 162 photos that evening, and kept 35. This is something you would never do with film. While I was photographing the units, a crewman came out and started them up. For the above photo, I was standing on the station platform shooting toward where I was standing when I took the first photo of this post. Note the historic H.R. Krug Furniture Company building in the background. I don't know the age of this building but it has clearly been there for a while! At 19:11, VIA 911 pulled train VIA 87 up to the station. This was my first time seeing 911 and it was nice to see it in a "Canada 150" wrap, advertising Sarnia, Vancouver, Ste-Foy and Sackville. They didn't linger long... a quick stop and they were off, with VIA 913 on the rear. They had a "Canada 150" wrapped coach in the consist, VIA 3355. I didn't really have much of a chance to set up, so this was the best I could do. GOT 326 was the cab car in the lead. I didn't catch the number on the locomotive pushing on the rear. I took a few photos inside the (pretty much deserted) Kitchener VIA / GO / bus station. That was it for me, so I walked back up to the hotel for the night. 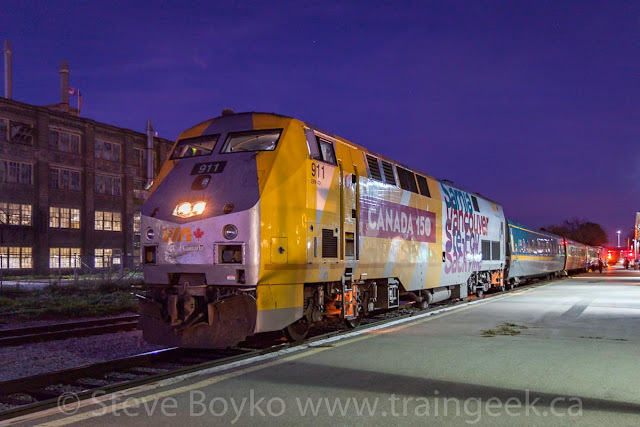 I resolved to return in the morning to catch the morning VIA Rail train 84. The train station is an impressive sight in the day. 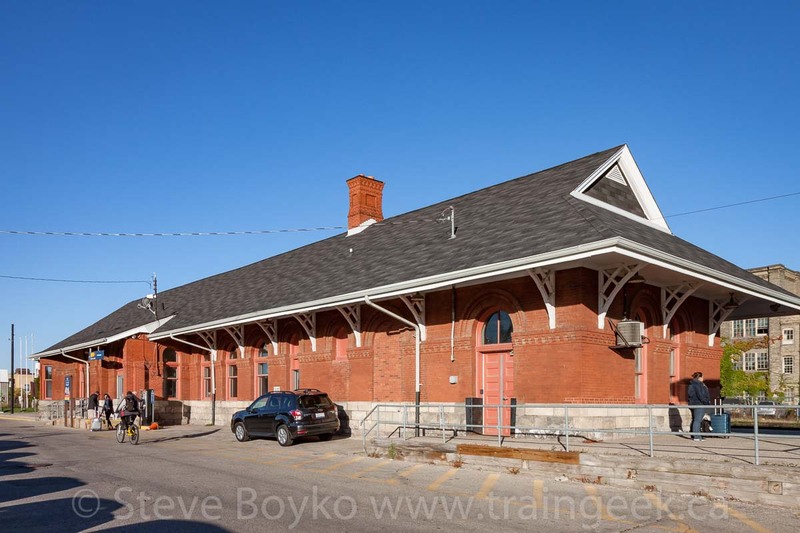 It was built by the Grand Trunk Railway in 1897. At one time it had a clock tower but it was removed by CN in 1966. The station was designated a railway heritage structure on February 15, 1994. 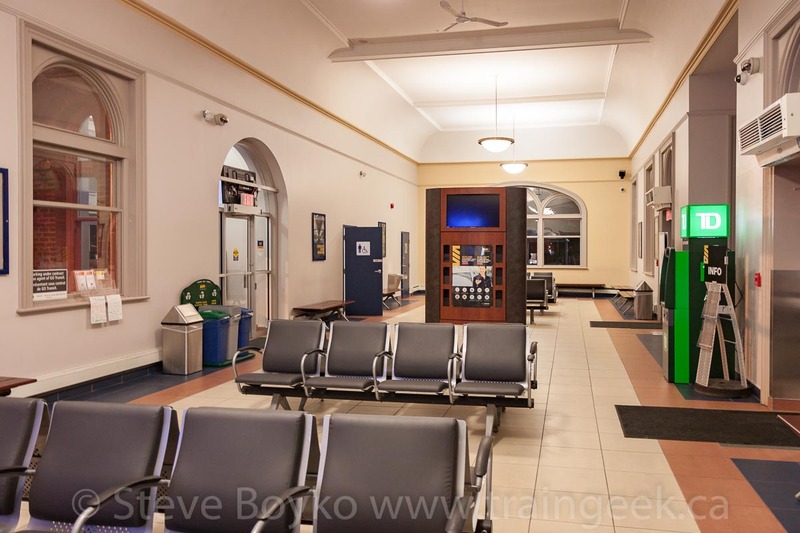 At one time it hosted the VIA-Amtrak International Limited. 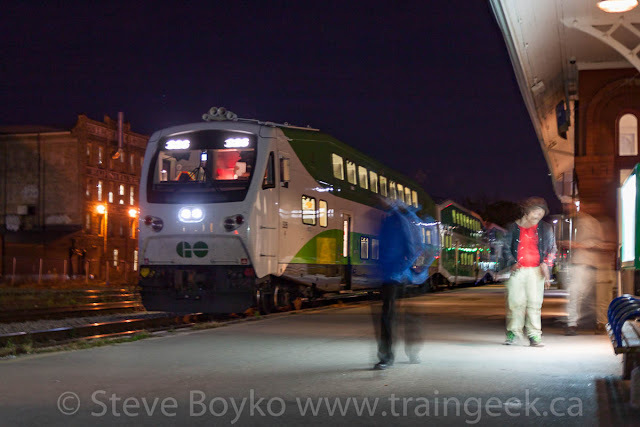 Recently it has started hosting GO Transit trains since the start of GO service to Kitchener. VIA and GO service are due to be relocated to the new King-Victoria Transit Hub aka Central Station a few blocks west of this station. 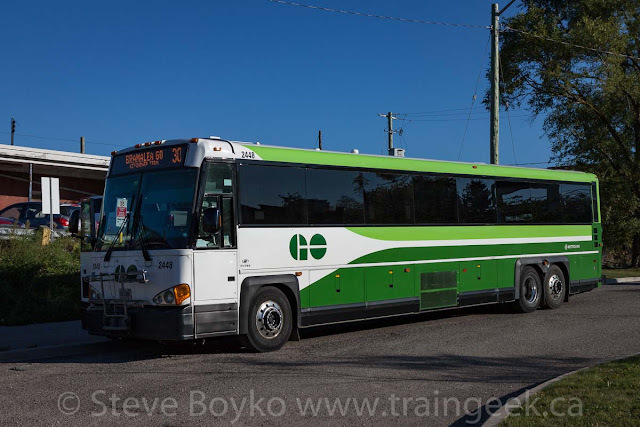 It will also serve the new ION light rail system that is starting up in the Kitchener-Waterloo area. 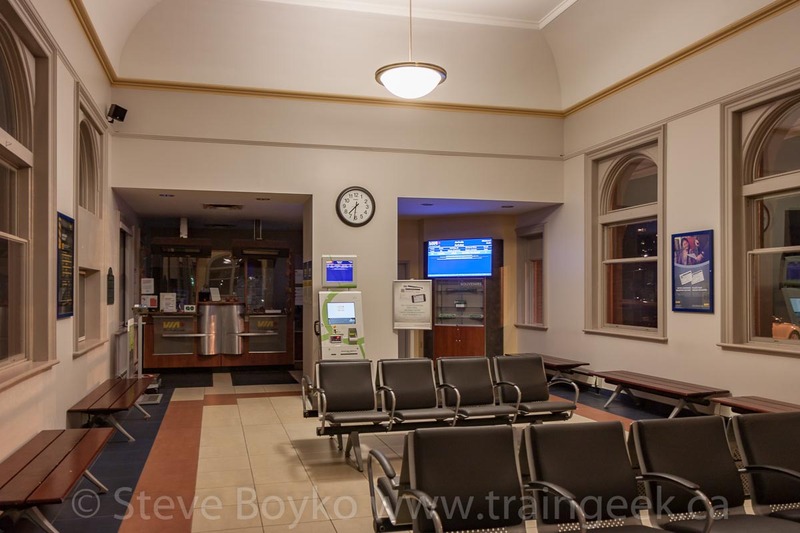 I don't know what will happen to the GTR station, but since it is protected it should continue to enjoy some public use after the railway moves out. I should mention that the freight shed portion (in the foreground of the photo above) is used by the Goderich and Exeter Railway (GEXR). Their sign is on the end of the station and there were a few GEXR road vehicles parked in the lot when I was there. 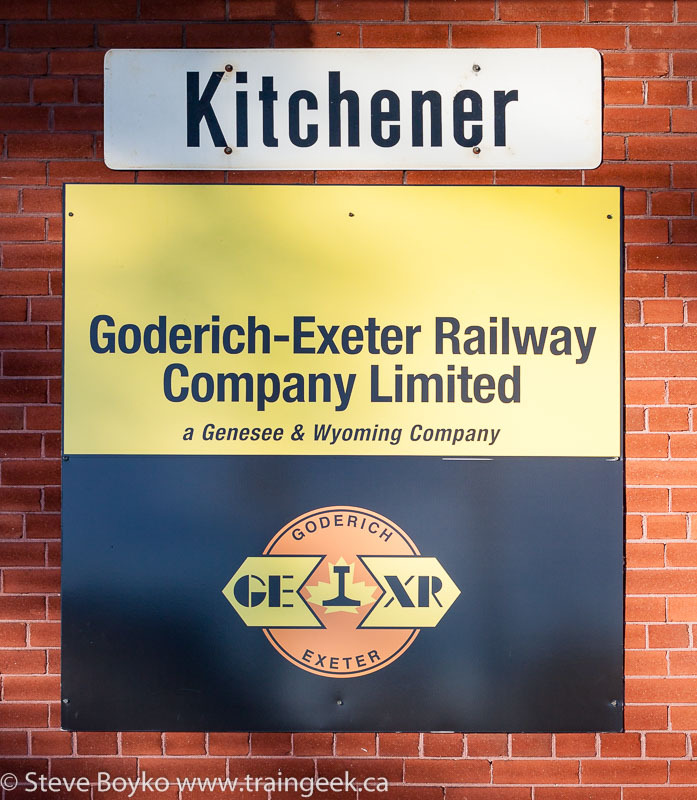 The GEXR operates the former CN Goderich and CN Guelph subdivisions, serving many local customers. It interchanges with CP in Kitchener and Guelph and with CN in Toronto. I set up just past the station to try to photograph the train with the Krug factory in the background. I didn't know where the train would stop so I had to guess a bit. I think it worked out OK. There were a LOT of people boarding, so the train sat for about 5 minutes while the passengers got on. 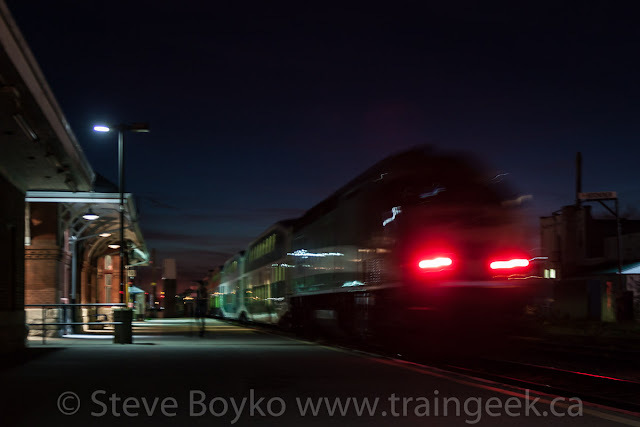 This gave me a couple of minutes to photograph a bit of the train and get in position to capture them leaving. I photographed the train leaving and caught a little reflection of VIA 913 trailing as they headed out of town. 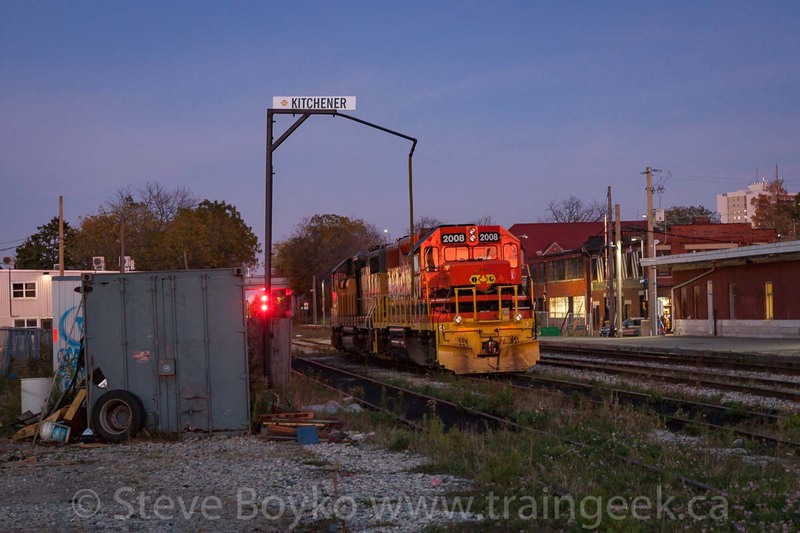 That was almost the end of my railfanning in Kitchener. I met up with my son Nick and had supper with him and his girlfriend, then we paid a quick visit to the new depot built to service the ION light rail equipment. Everything looked very nice and new. ION will eventually have 14 Flexity Freedom light rail vehicles, with the option to buy up to 16 more. The first vehicle was undergoing testing on site in Kitchener in November 2017. 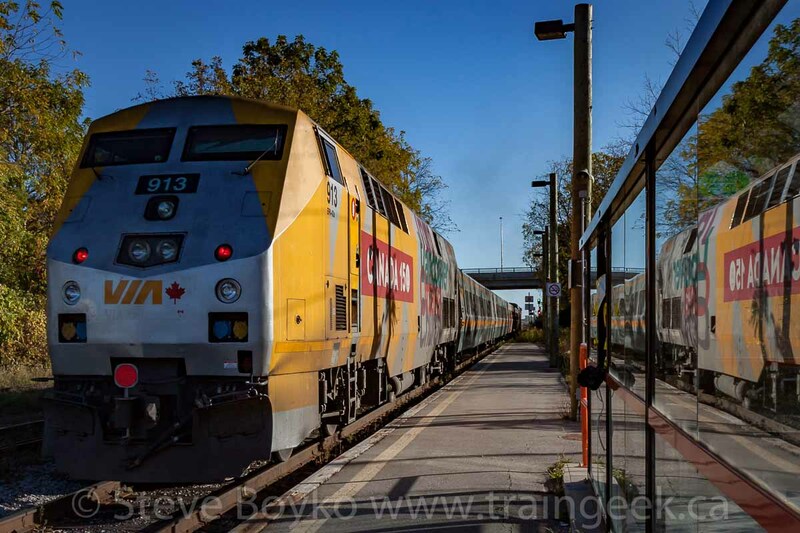 The service has been delayed due to delivery problems from Bombardier, and it is now expected to open in early 2018. 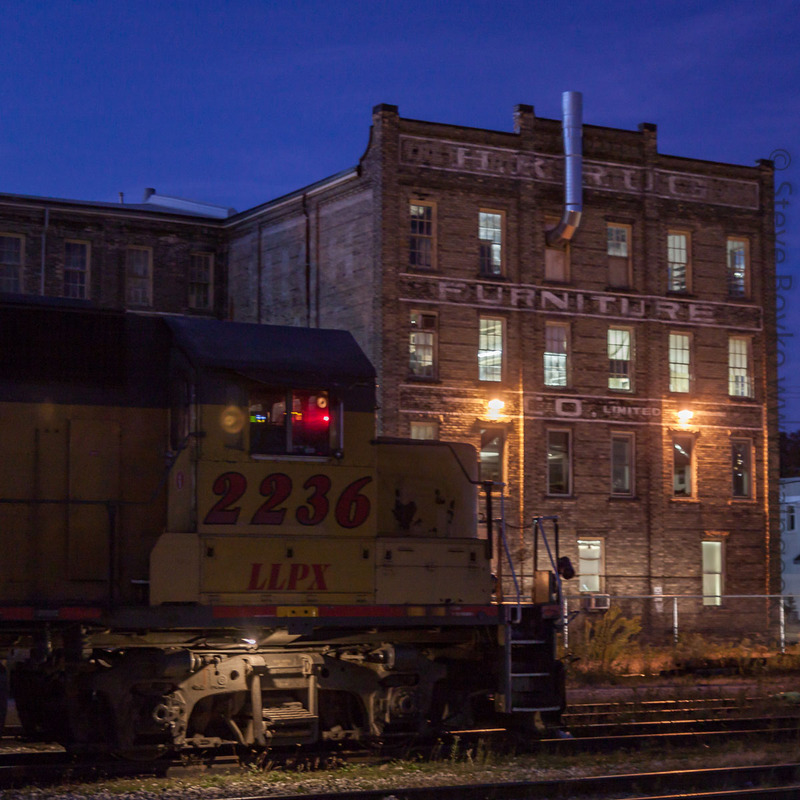 That was it for my railfanning in Kitchener. Nick graduated on the 20th, his girlfriend graduated on the 21st, and I made my way to Toronto to fly out. I did a bit of railfanning on the way... I might write about that another time. 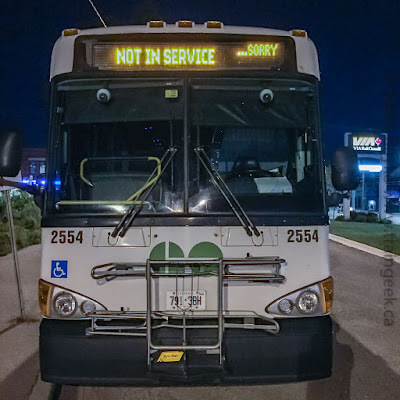 I'll leave you with another bus, GO Transit #2448. This is a Motor Coach Industries D4500CT bus. Awesome photos! Love the H.R. Krug Building! Ghost signs are cool. 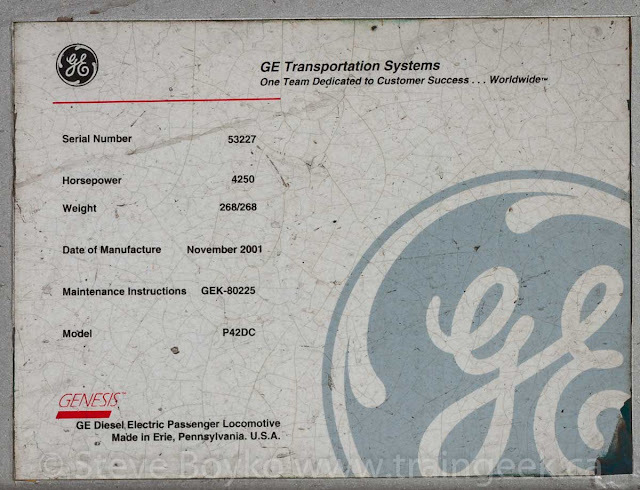 Soooo why do they renumber a locomotive when it's rebuilt? Thanks, Jenn, it's a great building! Great question on the renumbering. 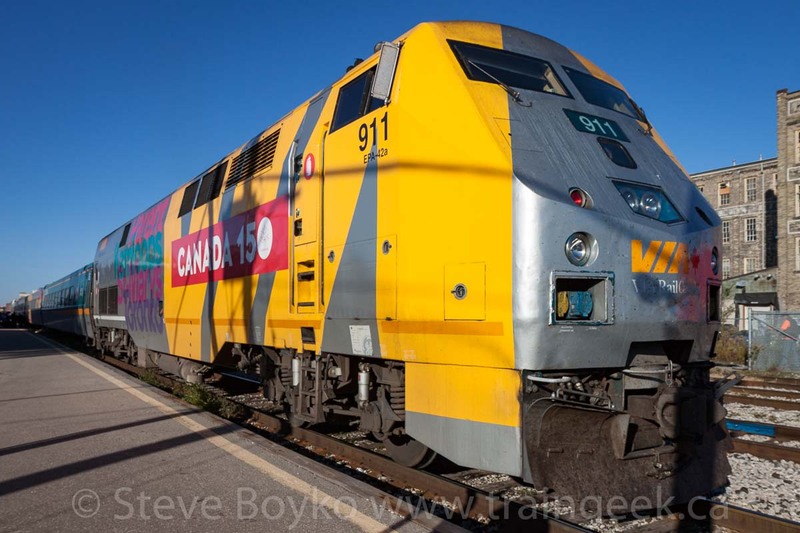 Sometimes only some of a series of locomotives get rebuilt, so they are renumbered to differentiate them from the locomotives that are not rebuilt. For example, CP's RS18 locomotives were originally in the 87xx-88xx series, but some of them had their noses chopped off and were renumbered to the 18xx series. Sometimes a railway buys another railway, and they have to merge the fleet numbers together. I think that has happened several times with CN when they bought, say, Grand Trunk Western or Illinois Central. Any duplicate engine numbers or series have to be resolved so some renumbering takes place. Hi George, thanks so much! I'm glad you liked my Ontario posts.. I always enjoy reading your posts. Merry Christmas! Thanks for the explanation Steve! Merry Christmas to you and your family! I was just in the area in November and caught some of the same sights, albeit on a much greyer (read: rainy) day. This is a fascinating spot for railfanning. 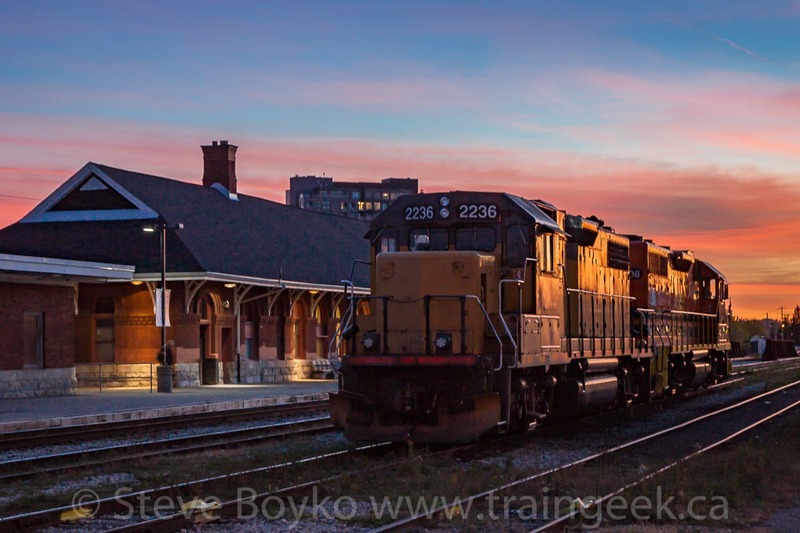 I just wished I had done more railfanning when I lived in Kitchener. Be sure to stop by my blog in the coming weeks for some more Kitchener railway shots. Nice work. 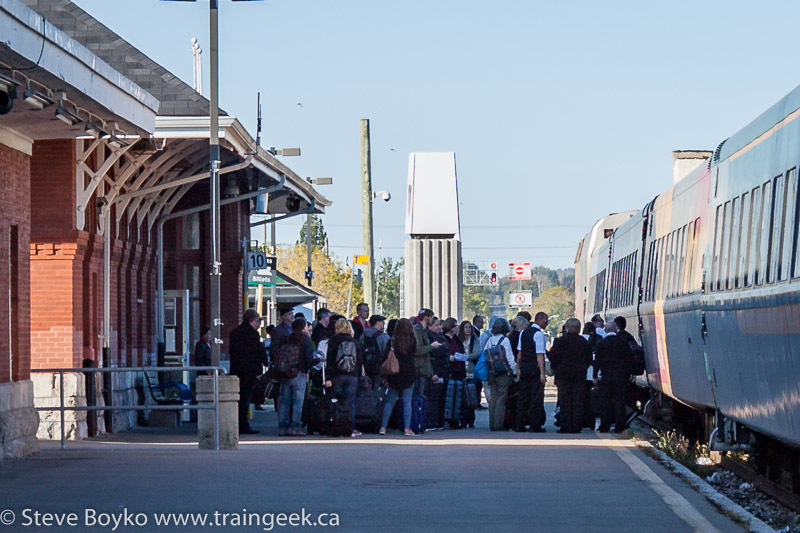 Hi Michael, I look forward to your Kitchener railway photos!